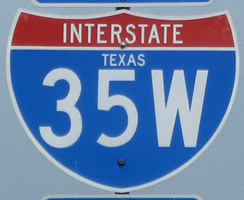 Interstate 35 splits into Interstates 35E and 35W to serve Dallas (east) and Fort Worth (west). 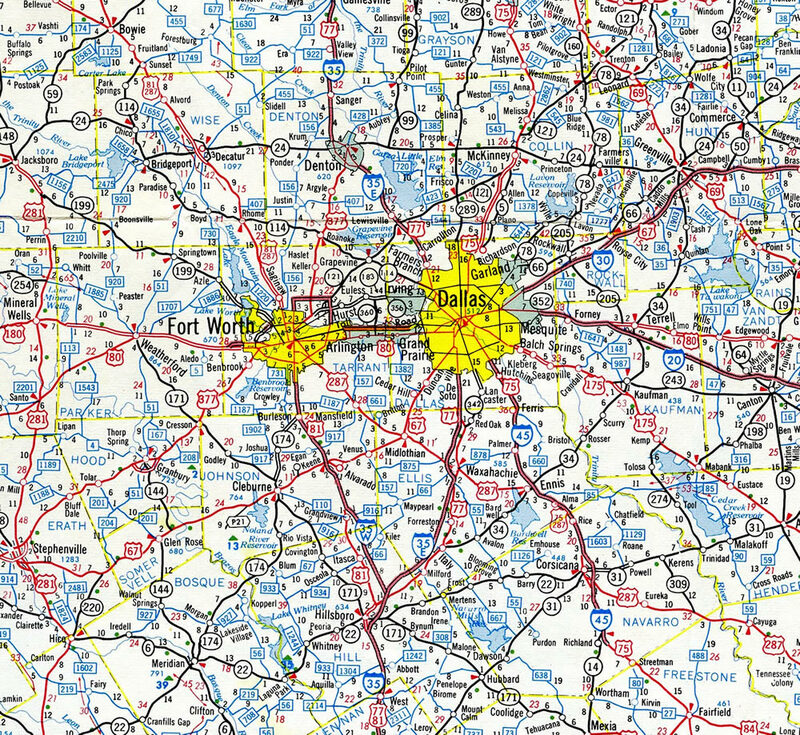 The two routes diverge north of Hillsboro, through rural reaches of Hall County and reconvene on the west side of Denton. Interstate 35W angles northwest to Grandview and Alvarado through rural areas of Johnson County before crossing the Tarrant County line at Burleson. A business route serves Alvarado, near the junction with U.S. 67. 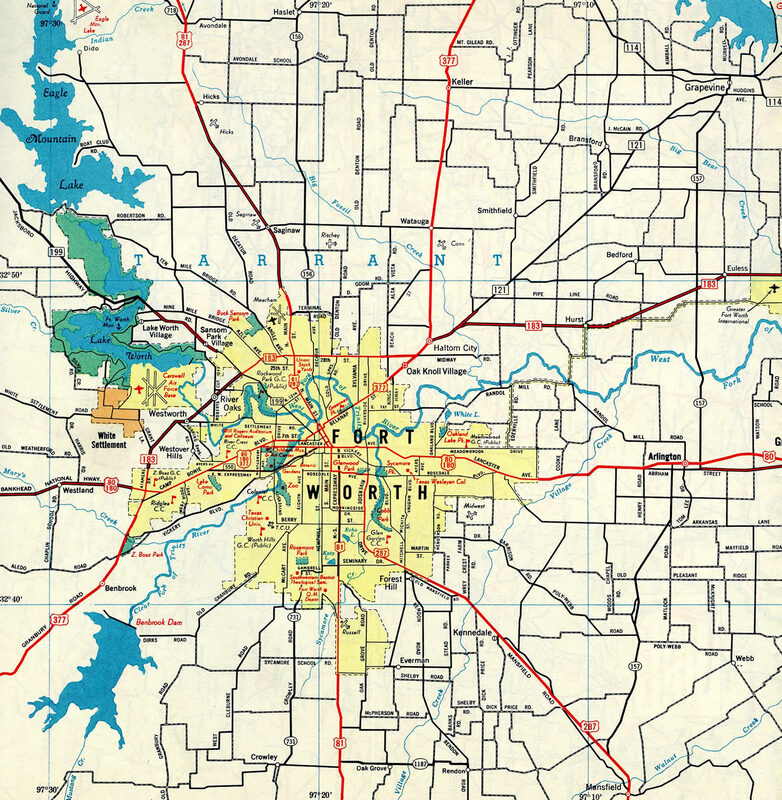 It is signed as Business Loop I-35 versus 35W. IH 35W (South Freeway) passes west of Fort Worth Spinks Airport (FWS) through an area of retail in south Fort Worth. The freeway advances northward by a large industrial park to Interstate 20 near the town of Edgecliff Village. 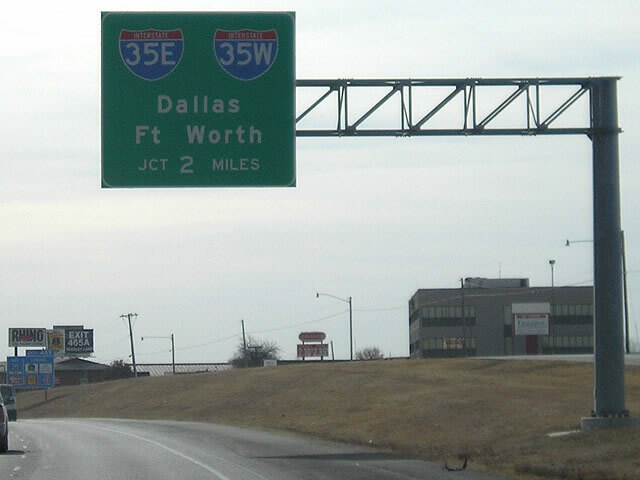 IH 35W bisects central Fort Worth to Downtown, where it meets Interstate 30, U.S. 287 (Martin Luther King, Jr. Freeway) and Texas 121 (Airport Freeway). 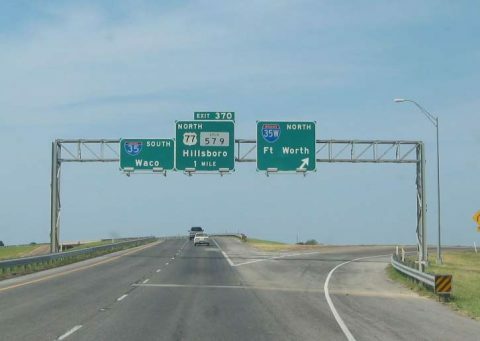 U.S. 287 combines with IH 35W north from there across the Trinity River West Fork through another industrial park area ahead of Interstate 820. 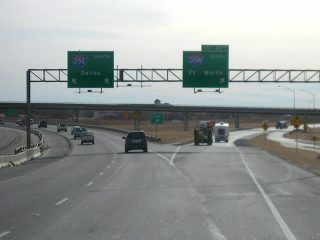 A wye interchange separates U.S. 287 from IH 35W beyond residential subdivisions along Basswood Boulevard. 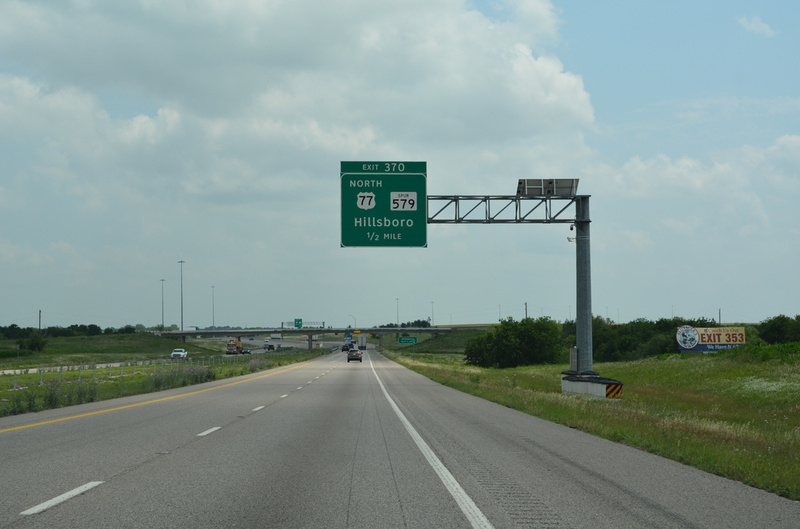 This split represents the northbound beginning of U.S. 81, which IH 35 and IH 35W replaced southward to Laredo. 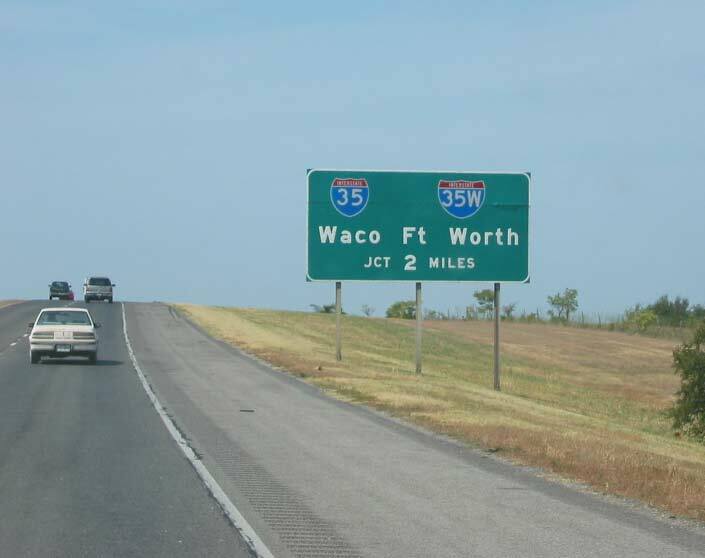 Passing by Fort Worth Alliance Airport (AFW), Interstate 35W (North Freeway) crosses the Denton County line en route to Northlake and Texas Motor Speedway. The remainder of the route west of Argyle and through south Denton is mostly rural to the merge with IH 35E. 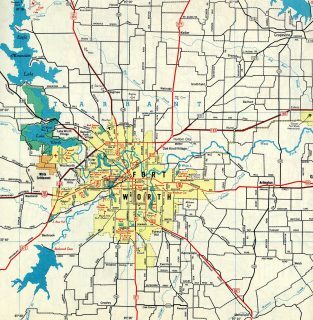 The North-South Expressway, then U.S. 81, appeared in this 1954 General Drafting Map as Fort Worth’s first freeway. U.S. 81 was truncated northward from Laredo to IH 35W north of Fort Worth in 1993. 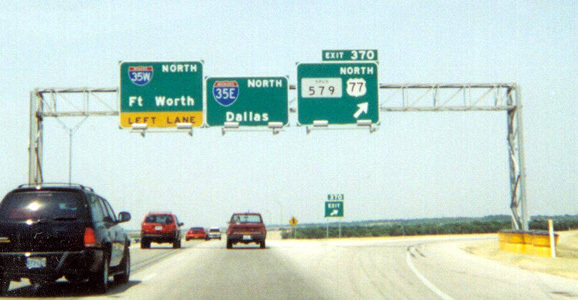 Interstate 35W between north Fort Worth and Denton was the last portion of the IH 35 branch split to open through north Texas. 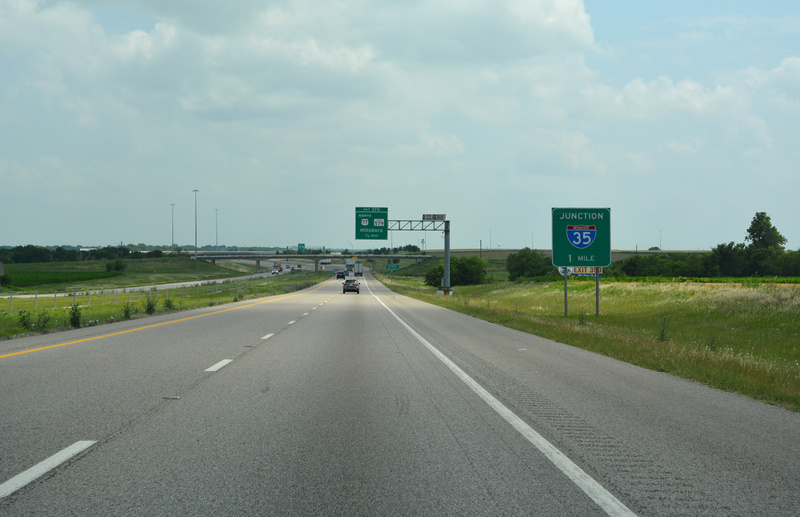 IH 35 was expanded to six overall lanes in 2016-17 leading to the separation with IH 35E to Dallas and IH 35W to Fort Worth. Photo taken by Jeff Morrison (12/28/05). 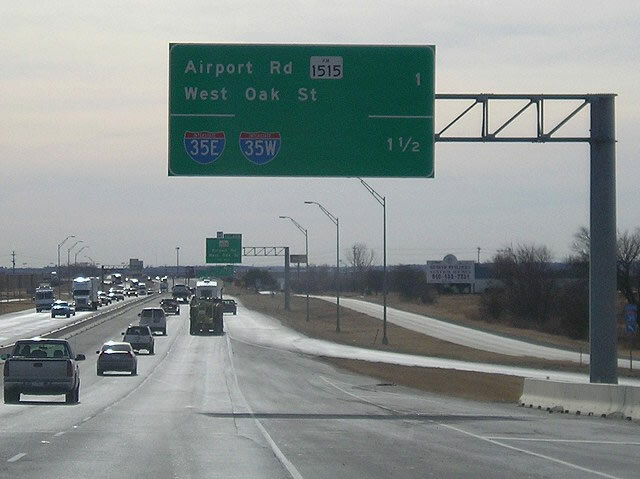 A slip ramp (Exit 468) precedes the semi-directional T interchange (Exit 467) with IH 35E/W for FM 1515 (Airport Road) and West Oak Street. Photo taken by Jeff Morrison (12/28/05). 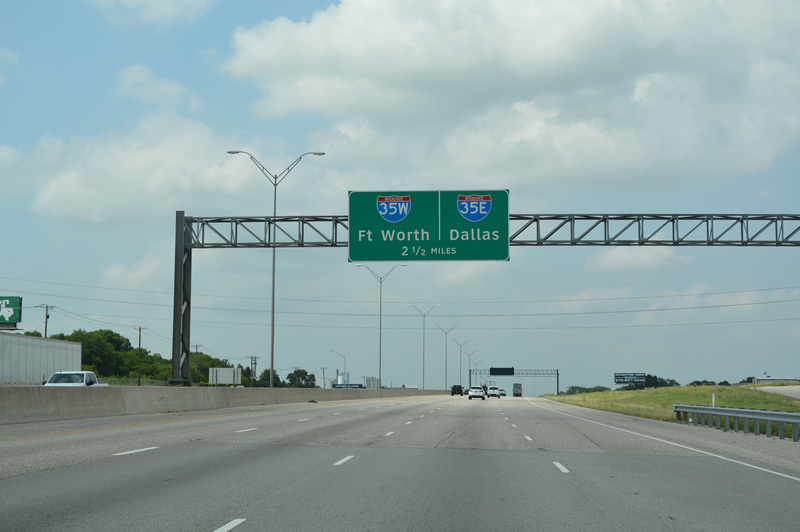 Interstate 35E branches southeast from Denton to Corinth, Lewisville Lake and Dallas while Interstate 35W trends westward to Argyle, Northlake and Fort Worth. Photo taken by Jeff Morrison (12/28/05). IH 35W combines with IH 35E seven miles south of south of Itasca. There is no access to IH 35E north from IH 35W south. The southbound roadway however connects with Exit 370 to U.S. 77 north & SS 579 prior to the resumption of IH 35 through Hillsboro. Photo taken 09/04/09. IH 35 north at State Spur 579 west and U.S. 77 north at Hillsboro. Photo taken by Marc Welby (08/00). Two miles ahead of the merge with IH 35W on IH 35E in rural Hill County. Photo taken by Justin Cozart (08/02). 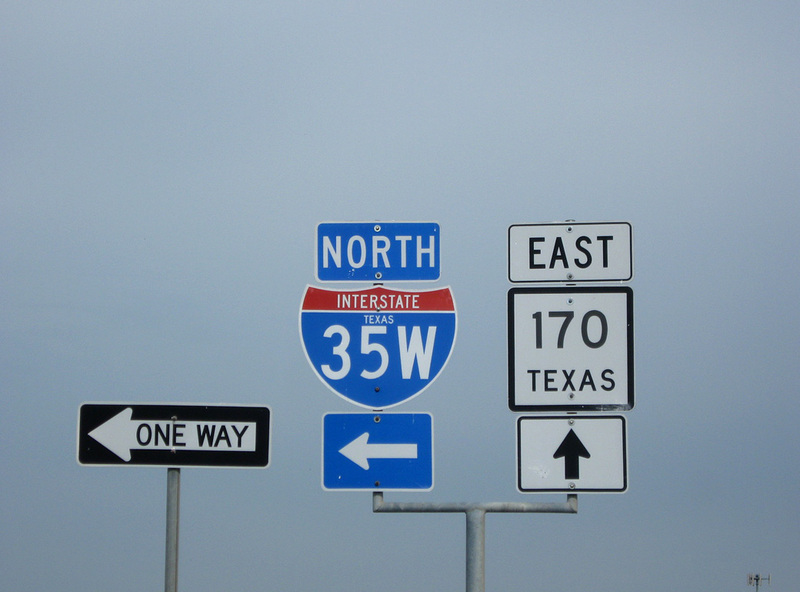 Former button copy signs at the three wye interchange where IH 35E/W converge outside Hillsboro. Photo taken by Justin Cozart (08/02). Slotboom, Oscar (2014). Fort Worth Freeways. 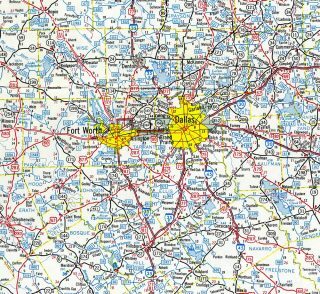 Dallas-Fort Worth Freeways, Texas-Sized Ambition, Retrieved from http://www.dfwfreeways.com.